And here I am, blatantly making the claim myself. Sugar cookies are a Christmas tradition in my family. 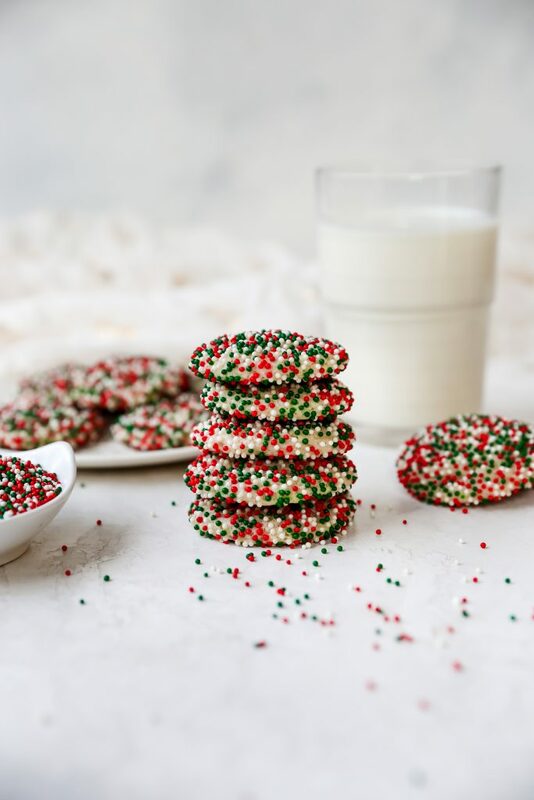 They were one of four or five cookies recipes that were considered a must make during the holidays. My mom, sisters, and I would often devote an entire day to baking our holiday treats, and sugar cookies were always on the list. I am not wild about sugar cookies. There. I said it. I mean, I LIKE them. I’m not exactly one to turn down any sort of cookie, after all. They taste good (sugar and butter usually taste good together), but they were never the most exciting treat to me. Plus, they are SO HIGH MAINTENANCE! You make the dough, chill the dough, roll out the dough, cut out the dough into shapes, decorate the dough, and REPEAT…all before they even go into the oven! I guess technically the decorating can happen afterwards too, if you’re piping frosting onto them but that’s just another step! I realize I sound like a scrooge, but roll-out cookies are the worst. 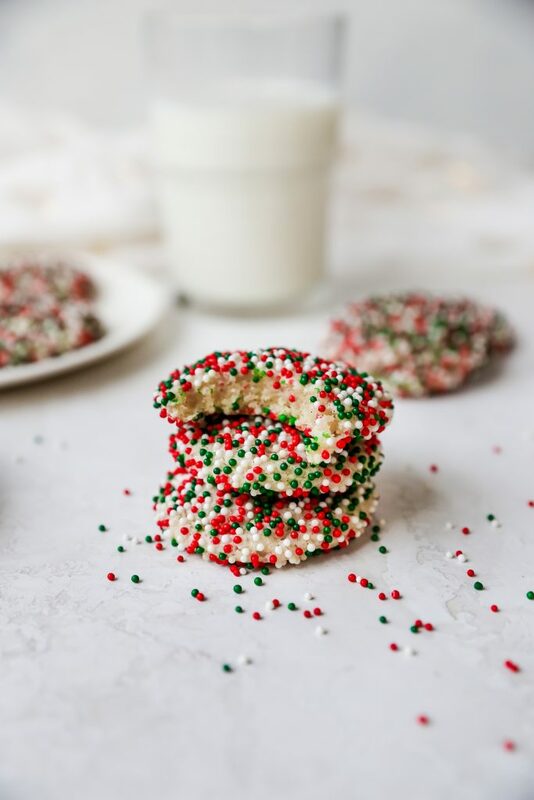 This, just days after I shared these gingerbread cookies with you, which are totally a roll-out recipe. Hah. 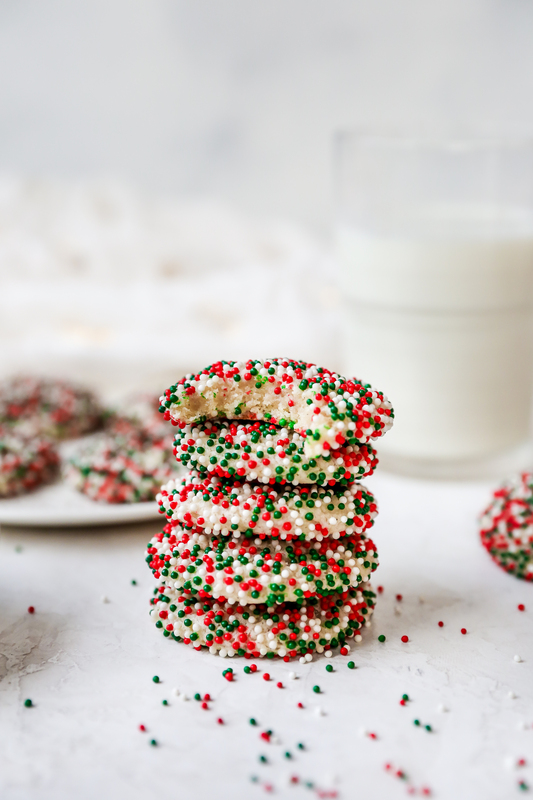 Plain old sugar cookies just never seemed worth the effort to me, quite frankly. UNTIL I made this recipe. I discovered no-roll-out sugar cookies several years back, and I’ve never gone back to the roll-out version again. Although, I may make an exception this year and do them with Kieran as a fun project. That alone makes the process seem more worth it, no? 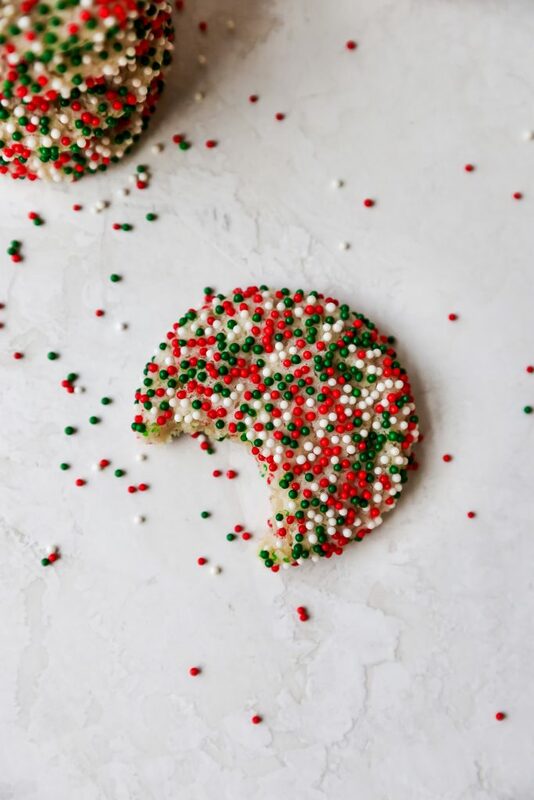 But these cookies will forever be on my Christmas baking list. I think I’ve made them every year for the past five years or so. Definitely a must make! First, sugar cookies are Dan’s FAVORITE. They are his #1 cookie variety, and I can’t deprive him during the holidays. Second, these are so fun and easy to make (no, REALLY), I don’t really have an excuse. You make the dough, chill it for a bit, and then roll it into balls. 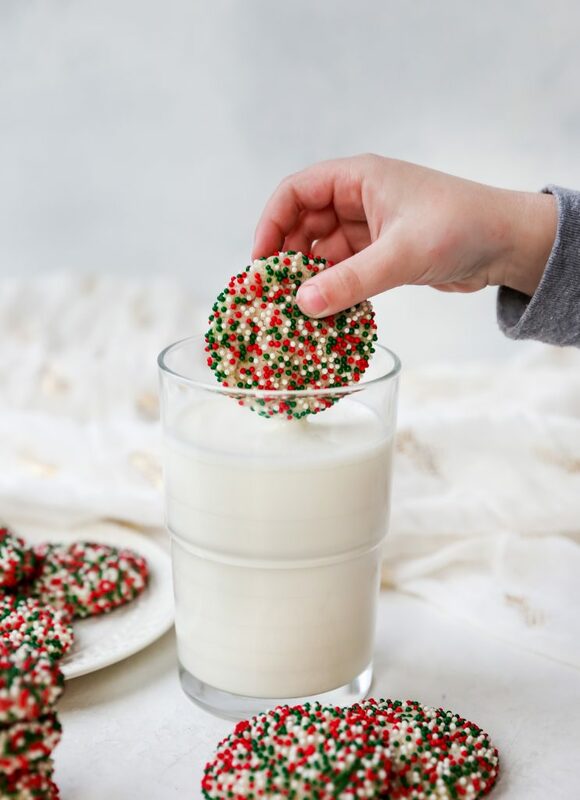 The dough is SO easy to work with and the cookie balls come together with minimal effort. 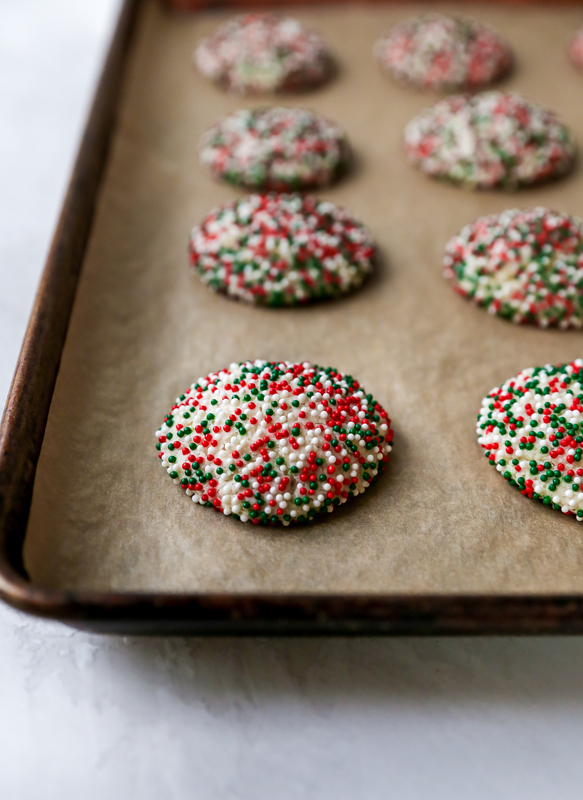 Then, you coat them in sprinkles, sanding sugar, or even just plain sugar and bake them off. They come out perfectly every. single. time. The best part? 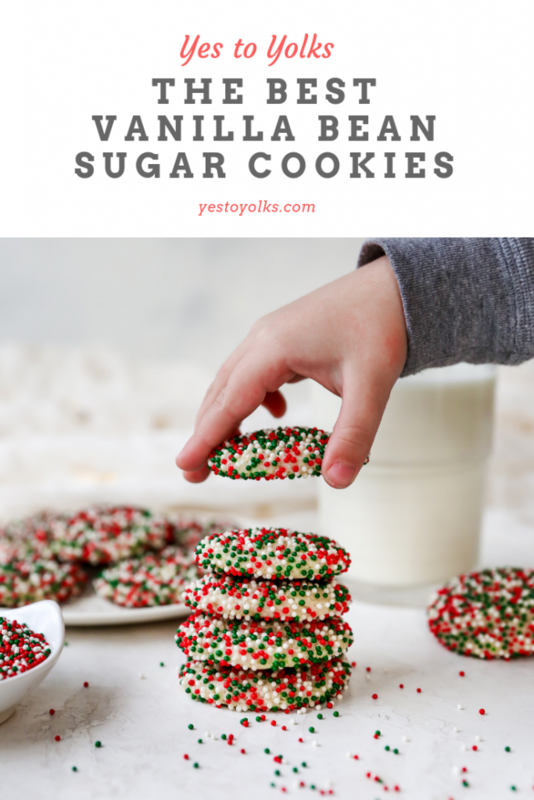 THESE sugar cookies are soft, tender, and have a lovely chew to them. UNLIKE roll-out sugar cookies which always bake up hard and kind of “bleh” tasting to me. These are heavy on the vanilla bean flavor, too, which I love. 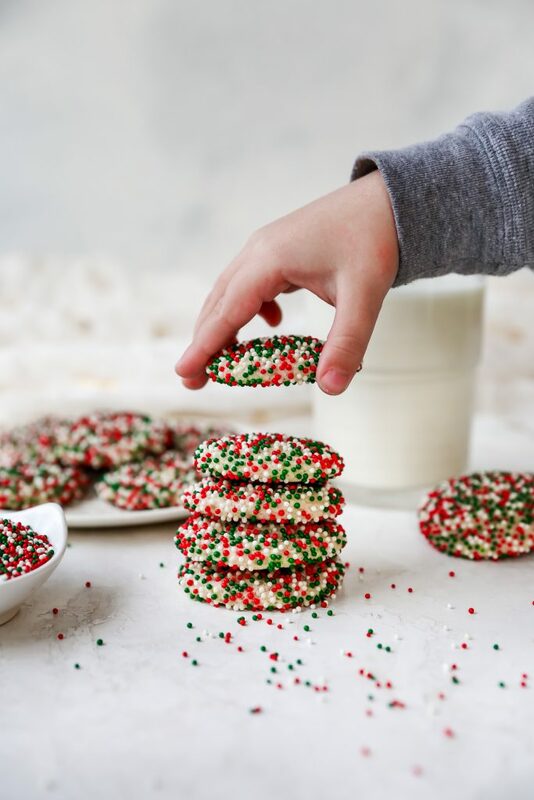 You can decorate them in any variety of sprinkles/sugars that you like, and they’ll be the most festive thing on the cookie table! So yeah, basically, these ARE the best sugar cookies if you’re anti-roll-out-cookie, like me. I stand behind my claim, people. In a bowl, whisk together flour, baking powder, baking soda, and salt. Set aside. Whisk together the melted butter, cream cheese, and sugar in a large bowl until smooth. Whisk in the oil next. Add in the egg, milk, and vanilla bean paste/seeds and whisk until smooth. Add the dry ingredients in batches, folding them gently into the wet ingredients, and mixing until no dry clumps remain. The dough should be soft but not overly sticky. Pinch it together between your fingers to see if it holds together. If the dough is too soft to easily roll into a ball, place the bowl of dough into the refrigerator to chill for 15 minutes (you can also make this dough ahead and keep it in the fridge for a few days until you need it. It is nice to work with when it's chilled!). Pour the spinkles and/or sanding sugar into bowls. 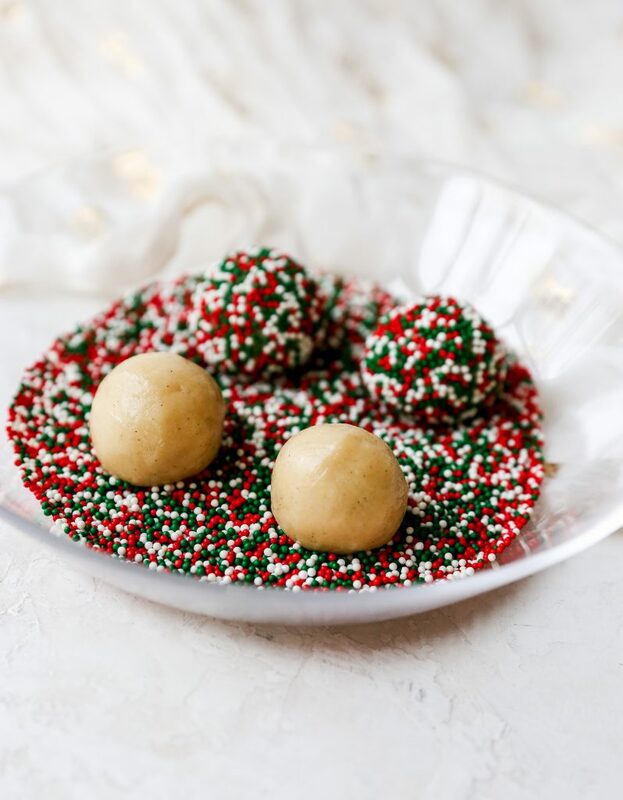 Using a medium cookie scoop, portion out balls of the dough that are roughly 1½ inches in diameter. Using your hands, roll them into smooth balls and then place the balls of dough in the sprinkles/sanding sugar and roll to coat. 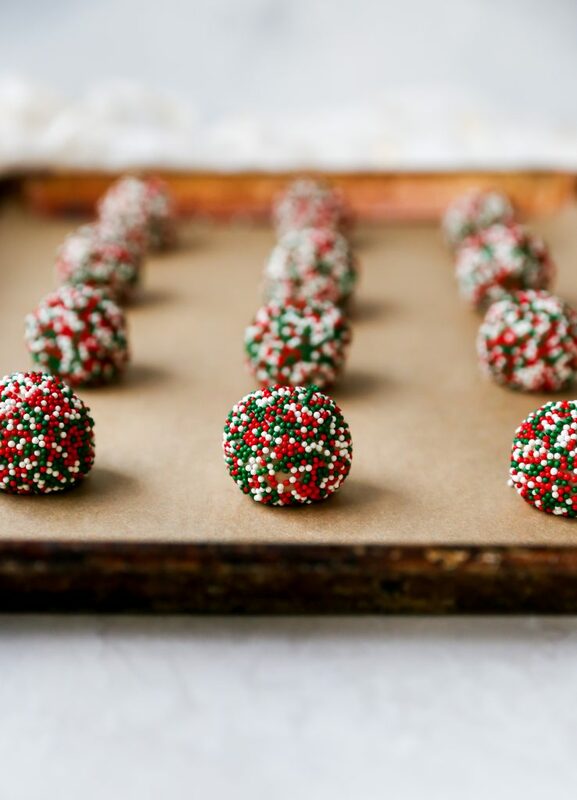 Place the coated cookie balls on the prepared baking sheets, leaving roughly 2 inches of space between each cookie. 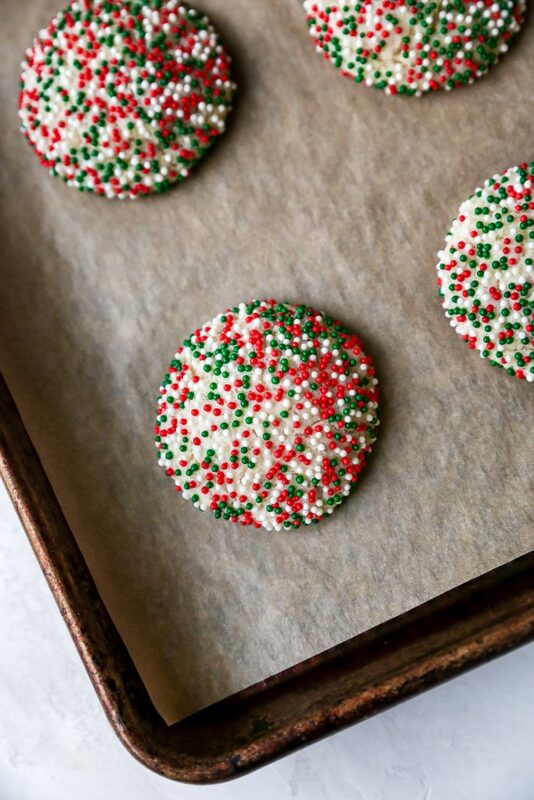 Bake for 10-12 minutes, or until the cookies are set and crackled. Cool on the baking sheet for a few minutes and then transfer to a wire rack to cool completely.